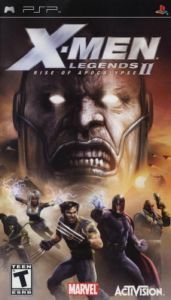 The sequel to the best-selling X-Men title ever, X-Men Legends, X-Men Legends II: Rise of Apocalypse is an all new action-RPG that lets players create, customize and control teams of four mutants from 16 all-time favorite X-Men and classic Brotherhood villains from the Marvel Universe. With the X-Men and Brotherhood fighting side by side for the first time, players switch instantly between teammates wielding many more super powers and skills than X-Men Legends, as they overcome obstacles, solve puzzles and defeat more than 100 types of enemies including Lady Deathstrike and the notorious Four Horsemen of Apocalypse. Delivering significant gameplay enhancements over the first title, X-Men Legends II: Rise of Apocalypse challenges players to explore immense, destructible environments set in classic X-Men locations like Genosha and the Infinite Factory, and exotic worldly locales like Egypt and the Savage Lands in both single player and, for the first time ever, online multiplayer modes. From hated foes to united force &#151; Experience the amazing saga of X-Men and Brotherhood rivals bonded by a common enemy in theatrical-quality FMV created by Academy Award(r) nominee Blur Studios. Create, customize and control a punishing team of 4 powerful Mutants, selecting from 16 playable characters&#151;several playable for the first time. Choose from your favorite X-Men characters&#151;including Wolverine, Bishop, Cyclops, Nightcrawler and Storm&#151;and Brotherhood mutants&#151;such as Magneto, Toad and Juggernaut. Instantly switch between team members mid-fight to take full advantage of their unique abilities. Combine their powers for even more bruising combo attacks. Twice the customization capability &#151; In X-Men Legends II: Rise of Apocalypse each character has more than double the arsenal of superpowers at their command than in X-Men Legends. Instantly upgrade and customize your character's levels and powers on-the-fly with just the touch of a button. Empower your character with new, diverse and more relevant items; switch costumes between Ultimate, Astonishing and other classic looks; and upgrade attributes, such as strike, speed and focus. Play online with friends around the world &#151; For the first time ever in the X-Men world, take your skills to the next level with online multiplayer action. Six multiplayer skirmish modes offer head-to-head "versus" action, battles against enemies, exclusive online content and more. Engage with up to three other players in offline multiplayer co-op story mode, featuring dynamic joining that lets your friends jump into the action anytime. Open-ended storyline and choices &#151; X-Men Legends II: Rise of Apocalypse features an all-new, flexible storyline that lets you select missions in the order you choose, whether you want to dive into the action or explore. Get creative, using your super powers to solve puzzles. Take advantage of over 70 free-roaming zones to regroup, begin new missions, complete unfinished missions, gather information and stock up on equipment. Every time you turn a corner, unexpected surprises keep you on the edge. New difficulty levels add to the replayability&#151;allowing you to gain experience and loot. Amazing array of enemies and environments &#151; Demolish over 100 different types of enemies, from legions of Apocalypse's henchmen to classic villains such as Lady Deathstrike and the Four Horsemen of the Apocalypse. Fully destructible locales are more expansive, requiring even more exploration and containing many hidden items to uncover. Visit X-Men locales like the Weapon X facility and the Infinite Factory plus intriguing spots around the globe such as Egypt and New York City. Everywhere you go, discover hidden items, equipment and paths. Action-RPG excitement on the PSP&#151; X-Men Legends II: Rise of Apocalypse features exclusive content only available on the PSP platform. With four unique characters, in addition to all the characters from the console versions, players can select from a total of 20 playable characters. Plus, there are exclusive game levels to explore, only available on the PSP. Choose to play through the game in single player mode or with up to three friends in wireless multiplayer co-op. Play with the X-Men on your PC &#151; For the first time ever, gamers can experience the X-Men Legends franchise on the PC. 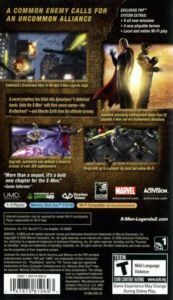 X-Men Legends II: Rise of Apocalypse features all of the exciting action-RPG content from the console versions plus a host of exclusive playable characters and level maps. Full online support with an integrated GameSpy server browser, online and offline four player co-op multiplayer, mouse and keyboard or gamepad support, improved graphics and hi-resolution modes let PC gamers experience the X-Men like never before.